This is the first book to deploy the methods and ensemble of questions from Afro-pessimism to engage and interrogate the methods of Early Modern English studies. Using contemporary Afro-pessimist theories to provide a foundation for structural analyses of race in the Early Modern Period, it engages the arguments for race as a fluid construction of human identity by addressing how race in Early Modern England functioned not only as a marker of human identity, but also as an a priori constituent of human subjectivity. Chapman argues that Blackness is the marker of social death that allows for constructions of human identity to become transmutable based on the impossibility of recognition and incorporation for Blackness into humanity. 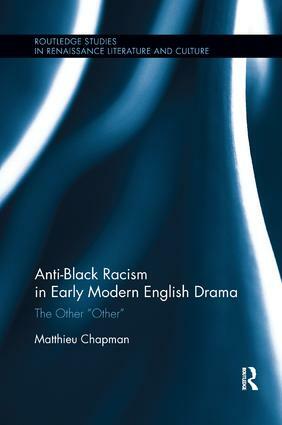 Using dramatic texts such as Othello, Titus Andronicus, and other Early Modern English plays both popular and lesser known, the book shifts the binary away from the currently accepted standard of white/non-white that defines "otherness" in the period and examines race in Early Modern England from the prospective of a non-black/black antagonism. The volume corrects the Afro-pessimist assumption that the Triangle Slave Trade caused a rupture between Blackness and humanity. By locating notions of Black inhumanity in England prior to chattel slavery, the book positions the Triangle Trade as a result of, rather than the cause of, Black inhumanity. It also challenges the common scholarly assumption that all varying types of human identity in Early Modern England were equally fluid by arguing that Blackness functioned as an immutable constant. Through the use of structural analysis, this volume works to simplify and demystify notions of race in Renaissance England by arguing that race is not only a marker of human identity, but a structural antagonism between those engaged in human civil society opposed to those who are socially dead. It will be an essential volume for those with interest in Renaissance Literature and Culture, Shakespeare, Contemporary Performance Theory, Black Studies, and Ethnic Studies. 2. "If They Were Black, One Would Not Feel It So Much": Racial Discourse Separating Moors From Blacks in Early Modern England. Matthieu Chapman is an Assistant Professor of Theatre at Central Washington University.